With baby boomers entering their golden years in record numbers, it’s helpful to know how to start the search for elder needs! 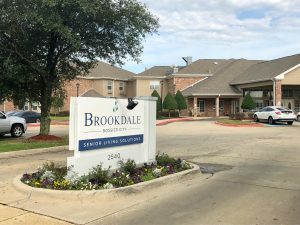 Learn how to navigate senior care in Bossier Parish with the experience of locals Bob and Dixie Callahan. Bob and Dixie are residents of Princeton. They each have parents that are at the age of needing extra care and attention. Bob works for Fire District No. 1 and Dixie works for Citizens National Bank. Bob relocated his father to The Blake in Bossier City from his home in Albany, NY. While care was available up north, the difference in cost for assisted living residence here was 50% less. “We were pretty lucky in that my dad retired from a pretty good job and had a pretty good pension, so he and Mom really weren’t bound by a lot of financial constraints,” Bob said. Restricting your search for facilities to those which only accept Medicaid will play a large role in your process of selection. The Blake as well as the popular Brookdale, for example, do not accept Medicaid. To Bob, the most important thing was location. Bob and Dixie visited The Bloom in South Bossier and really liked it, but decided to continue their search to find something closer to their home. 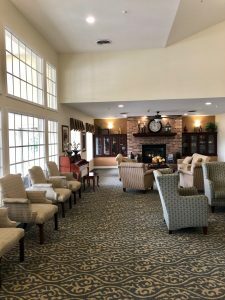 Bob’s father is not in need of memory care or extensive medical assistance that would require a nursing home, so a nice assisted living facility was a perfect fit for the 92-year-old. While settling Bob’s dad into his new residence gave the couple experience in the process of relocating a parent in this way, they are currently encountering a different set of circumstances with Dixie’s mother. Recently widowed and still a homeowner, she has a small pension and might just be able to afford a memory care facility, the type of which she will likely require. Dixie breaks down the searching process into major categories: cost, location, food type, activities and room size. 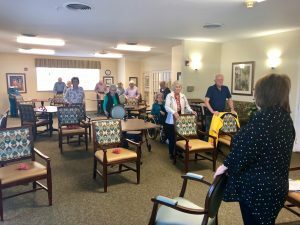 The last category might seem a bit different from the others, but the Callahans recognize that room size can actually be very important to the patient’s happiness. “It looks like their home…like the house they were in,” Dixie added. While Dixie still has not decided where her mother will move to, she is actively visiting and searching out all of her options. Betsy Williams is the Executive Director of Brookdale Bossier City. She says that an in-person visit is the only way to truly get a sense of a facility. Williams agreed that price and location are key factors in the guiding process, but mentioned also that quality of care and safety were equally large concerns. Prospective residents also look closely at the activities offered. Brookdale boasts the very popular “Bean Bag Baseball,” as well as games like Bingo and the typical arts and crafts. Residents there can also enjoy live music for entertainment, dining out for dinner and trips to places like the State Museum. Pricing for homes vary greatly depending on the type of care the patient requires; as one can imagine, the cost goes up as the medical needs increase. On average, Bossier residents can look forward to having truly outstanding care at beautiful facilities on the lower side of the national average.